The desert ironwood tree, Olneya tesota, is a member of the legume family and is the only species in its genus. It is commonly found in the deserts of the Southwest, especially Arizona. Ironwood trees are considered a keystone species in this region because they provide food and shelter for several species of animals and plants. Their heavy, dense wood is prized as firewood and as a shade tree in the desert. Learning some iron wood tree facts introduces you to this fascinating species. 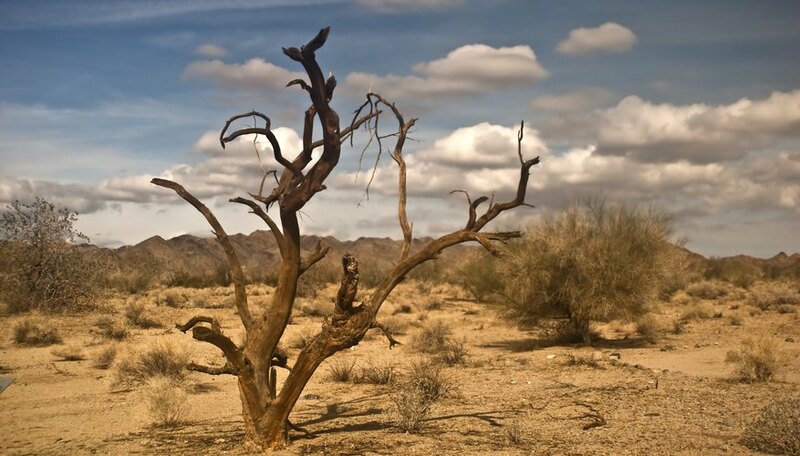 The Southwestern U.S. is home to the desert ironwood tree. Arizona hosts many of these trees, which thrive in desert habitats. Ironwood trees provide much-needed shade in the hot, dry environment. Most plant-life in these habitats can be described as low-growing desert shrubs. The height of ironwood trees makes them stand out in the landscape. They are sometimes called a “nurse” tree because many species of plants and animals shelter in the shade provided by the ironwood’s canopy. Ironwood trees belong to the legume family. Like soybeans and peas, these trees fix nitrogen in the soil, making it easier for nearby plants to absorb nutrients. Desert ironwood trees usually grow multiple trunks and its strong branches produce a wide canopy that can span 30 feet in diameter. The bark is gray and smooth but becomes cracked and shaggy with age. The bark is also studded with sharp thorns. Tiny hairs protect the leaves and twigs from the drying and scorching effects of hairs, desert sunlight. The grayish-green ironwood tree leaves do not change color before they fall and are compound and pinnate, meaning they are divided into leaflets attached to a long stem. The flowers grow in long clusters and resemble pea blossoms. Pale pink and purple flowers bloom in April and May and produce seeds in June and July. Both the flowers and seeds are edible for humans and other animals. Ripe seed pods resemble small, fuzzy pears and may be eaten fresh. They fall from the trees easily and are an important food source for desert animals, fresh or dried. Ironwood trees are deciduous, but they lose their leaves to conserve water during dry periods during winter, not because of falling temperatures or a decrease in sunlight. This conservation allows the trees to retain enough energy to produce flowers when spring brings rainy weather. Ironwood trees can live to be 150 years old. The desert ironwood tree grows 20 to 50 feet tall, making it the tallest tree in the Sonoran Desert. Its name comes from the heavy, dense heart wood the tree produces. The wood is one of the heaviest in the world. Unlike other types of wood, ironwood does not float because of its high density. It burns at a high temperature making it an ideal wood for a campfire on a chilly night. Mentzer, A.P.. "Facts About Ironwood Trees." Sciencing, https://sciencing.com/ironwood-tree-6710028.html. 23 August 2018.